ISOtunes Wired Noise-Isolating Earbuds provide the perfect protection for the worker who wants to enjoy music while staying safe on the job. These earphones provide hearing protection with NRR 29 sound blocking. This is enough protection from noise to keep your ears safe in high noise industrial environments and other noisy workplaces. When you need hearing protection but you want to be able to listen to music, ISOtunes is the perfect choice. And with built-in volume limiting, ISOtunes wired meets OSHA and NIOSH requirements. ISOtunes are tested and approved in accordance with ANSI, OSHA and CSA standards. ISOtunes provide a good NRR 29 protection from hazardous noise. This hearing protection is enabled by the TRIOLGY foam ear tips, which provide both noise isolation and sound blocking. External sound is prevented from entering your ear canals, keeping your ears protected from noise-induced hearing loss. And the resulting noise isolation makes your music sound absolutely incredible. ISOtunes wired are perfect for OSHA-controlled workplaces. Not only are they functioning hearing protection, but ISOtunes are also made with built-in volume limiting. ISOtunes SafeMax™ Technology keeps sound to a safe 85dB. And that means you can listen to your music all day long without posing any threat to your hearing. This volume limiting makes these earbuds OSHA-compliant. ISOtunes are built smart to work hard. They feature a durable braided wire cord that is harder to tangle up or damage than a standard straight cord. ISOtunes are also IPX5 sweat and splash proof, so they can stand up to hours of punishing use without requiring special care. And the 3.5mm gold-plated audio jack ensures an excellent connection with your sound source, even when you move and work. ISOtunes deliver high quality audio via independent 8mm drivers. The hi-fidelity sound is well tuned with a deep bass response sure to please. 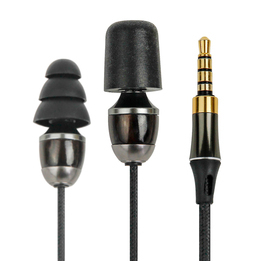 And the sound quality is enhanced by the noise isolating qualities of these earphones. As more background noise is blocked out, the clearer (and louder) your music comes through. You may find that you can hear details you've never heard before while using ISOtunes. You may also need to turn the volume down below what you're used to, now that the sound piping into your ears doesn't have to compete with all the background noise. ISOtunes also feature a voice mic with background noise cancellation. This mic eliminates steady background sounds such as jet engines, road noise, or machinery, so your voice comes through loud and clear. Replacement Ear Tips Now Available.